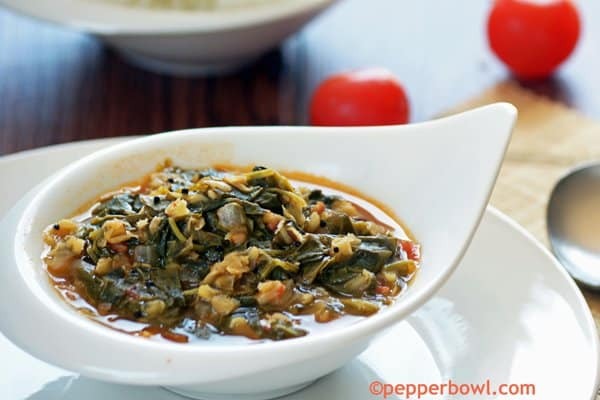 Vendhaya keerai Kootu, Methi leaves dhal-means fenugreek leaves cooked with lentils. A healthy, nutritious recipe with just a teaspoon of oil. South Indian, especially Tamil cooking is well known for its healthy recipes. Authentic Tamil recipes require no oil or very lesser oil. Those who prefers lesser oil menu could definitely try their hand with Tamil Recipes, with oil free breakfast recipes, and with lesser oil lunch menu recipes. Vendhaya Keerai Kootu is the very healthy recipe, easier to make with one pot using the pressure cooker with step by step pictures and instructions below. It’s simple everyday side dish to be served with Rice, Rasam. And my choice would be, having it with just plain rice and some ghee. It’s completely a kids friendly recipe and may provide the values of all green leafy vegetable. For making this recipe, pressure cooker method is preferable. Cooking kootu with the pressure cooker is not only to retain 100% nutritional value, but also I can do both seasoning and cooking in the same pot. Alternatively, my kitchen sink is not filled with too many vessels, best aspect for bachelors too. My other combo is spicy tomato rice and capsicum rice with this kootu. Recently one of my readers asked me for bachelor’s south Indian recipes. And this is the best recipe to kick start bachelor’s series and Pressure cooker series as well. 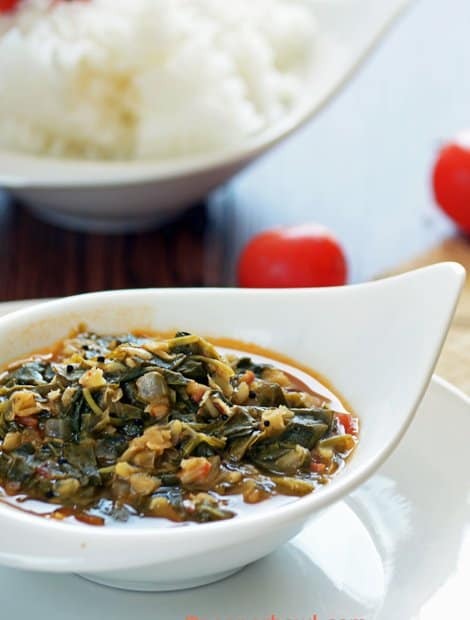 Vendhayakeerai Kootu, Methi leaves dhal-means fenugreek leaves cooked with lentils. A healthy, nutritious recipe with just a teaspoon of oil. South Indian, especially Tamil cooking is well known for its healthy recipes. Remove the stem and wash, clean methi leaves, chop onion and tomato as well. Wash and clean, pasi paruppu / moong dal too. In the pressure cooker, add oil followed by mustard seeds and urad dal. Wait till mustard gets splutter, Add moong dal, methi leaves, 3/4th cup water, turmeric powder and salt. Close the lid, and allow it to cook for 1 whistle. Allow the steam to escape. 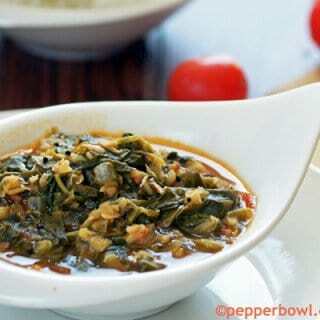 Open the lid, and gently mash the cooked leaves and dal, a little, with ladle. Serve hot with steamed rice. 1. Can be served as a side dish for steamed white rice. But pairs but great with roti/chapathi as well. 2. Perfect for lunch time. 1. Moong dal can be substituted with Toor dal too. 2. The same recipe can be used for making another verity of greens too. 3. This Vendhaya Keerai kootu is best to be paired up with Capsicum Kulambu, Maavathal Kulambu. Liked this recipe? Follow us on Facebook, Pinterest. I love methi, so going to try this for sure. Very healthy and delicious kootu.